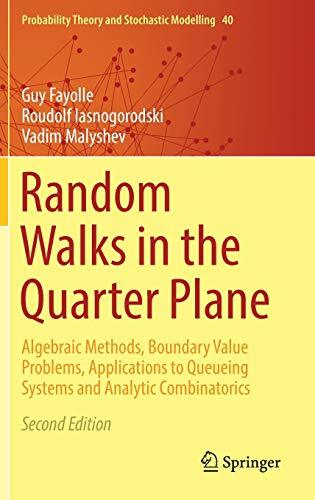 [PDF] Random Walks in the Quarter Plane: Algebraic Methods, Boundary Value Problems, Applications to Queueing Systems and Analytic Combinatorics (Probability Theory and Stochastic Modelling) | Free eBooks Download - EBOOKEE! Description: This monograph aims to promote original mathematical methods to determine the invariant measure of two-dimensional random walks in domains with boundaries. Such processes arise in numerous applications and are of interest in several areas of mathematical research, such as Stochastic Networks, Analytic Combinatorics, and Quantum Physics. This second edition consists of two parts. Part I is a revised upgrade of the first edition (1999), with additional recent results on the group of a random walk. The theoretical approach given therein has been developed by the authors since the early 1970s. By using Complex Function Theory, Boundary Value Problems, Riemann Surfaces, and Galois Theory, completely new methods are proposed for solving functional equations of two complex variables, which can also be applied to characterize the Transient Behavior of the walks, as well as to find explicit solutions to the one-dimensional Quantum Three-Body Problem, or to tackle a new class of Integrable Systems. Part II borrows special case-studies from queueing theory (in particular, the famous problem of Joining the Shorter of Two Queues) and enumerative combinatorics (Counting, Asymptotics). Researchers and graduate students should find this book very useful. No comments for "[PDF] Random Walks in the Quarter Plane: Algebraic Methods, Boundary Value Problems, Applications to Queueing Systems and Analytic Combinatorics (Probability Theory and Stochastic Modelling)".